PHOTO COURTESY RON LEBLANC Former UI track sprinter Lake Kwaza, right, and Nicole Vogt placed fourth in a North American Cup race this past November in Calgary, Canada. Lake Kwaza crouches down at the starting line, then bursts forward for maximum power. But instead of speeding down the straightaway of an eight-lane oval track, the former Hawkeye sprinter now surges along a sheet of ice for 30 meters pushing a 350-pound sled. 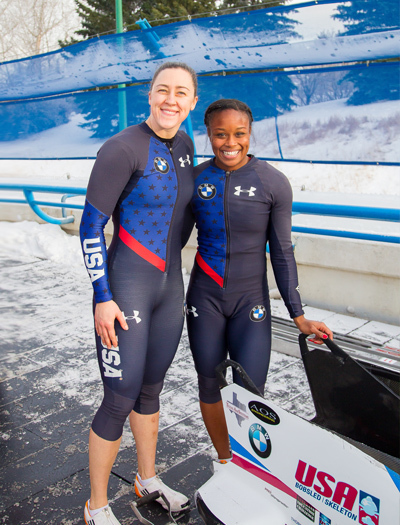 She hops in behind her driver and prepares for a journey of twists and turns ahead, embracing a new vehicle to reach her Olympic dreams—the bobsled. Nearly two years ago—after completing her senior season with the Hawkeyes and finishing 26th in the 200 meters at the Olympic Track and Field Trials—Kwaza turned down an offer from Michael Dionne, coach and director of development for the U.S. Bobsled and Skeleton Federation, to try bobsled. Dionne saw Kwaza’s track results, and the Big Ten 60-meter champion fit the profile of speed and force necessary for the winter sport.